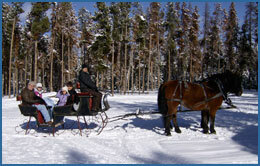 Come enjoy a horse drawn sleigh ride as we dash through secluded woods and meadows in our old fashioned sleighs! 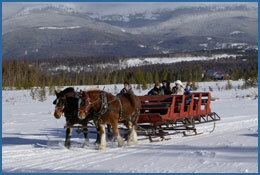 Snuggle under warm woolen blankets and relax to the sound of bells jingling as our team of gentle-giant draft horses carry your sleigh over historic glistening snow covered trails. After the ride, warm up by the fire while sipping hot cocoa and roasting marshmallows while the kids play on the sledding hill! 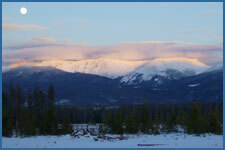 Continue to enjoy beautiful views of the Continental Divide as you visit around the camp fire at your leisure. We offer great family fun at an affordable price. 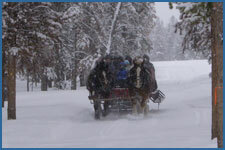 The whole family will enjoy the ride, the horses, refreshments, scenery and take home unforgettable memories of this sleigh ride. Bring the kids and the grandparents. They'll all enjoy it! If you enjoy the ride, please pet the horses and tip the guide. 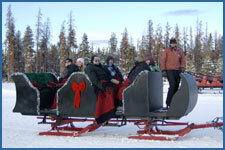 If you are looking for something a little more personal, we offer private rides on a smaller sleigh. Great for special occasions, or even just to spend some quality time with your family. Pricing varies on group sizes. Please call for more information. If you are interested in making a reservation or would like more information, please call (970) 389-2977. Gift certificates are available. We start taking reservations for the season in November. Reservations are required for all rides. Insulated attire is strongly recommended!